Since 1956, the beautiful campus of Saint Ann Catholic School has welcomed families of all backgrounds and means seeking a quality faith-based educational experience for their children. What differentiates us from other schools is not only our state-of-the art campus, but our dedication to high standards in all that we do. This emphasis is evident throughout our well-rounded curriculum: gifted, honors and resource classes paired with integration of technology throughout the grade levels. While other schools offer STEM, our STREAM initiative provides project based learning focusing on the integration of science, technology, religion, engineering, the arts and mathematics throughout the grade levels. Students have various opportunities to explore their creativity and self-expression through our award winning music, art and sports programs. Numerous extra-curricular activities such as the National Junior Honor society, chess club, Lego robotics club, drama club, scholar bowl, etc. as well as amazing field trips such as our 8th grade civics trip to Washington DC and Philadelphia, allow students to reach and engage in learning beyond the classroom. By setting high standards and promoting Christian virtues, students learn the value of hard work and living to their God given potential within a safe and supportive environment. Partnering with our parents and other stakeholders, students are given the opportunities to become confident Christian leaders. They take turns in rotation as readers/servers at the masses, lead the morning and afternoon announcements, pledge of allegiance, and other events. Younger and older students are buddied together for mass and other activities further creating a sense of community, responsibility and care. They learn to engage with teachers and one another in a way that promotes mutual respect and humility. They learn the value of self-less service at an early age by giving back to the community through various service programs. Teachers are empowered as leaders and role models as they direct various clubs, organizations and events. For example, one of our teachers directs the Mini-Vinnies, which is a service oriented student club that works in association with the St. Vincent DePaul Society for food collection and assistance to those in need. Our monthly K4J (Kids for Jesus) program, recognizes students who exhibit virtues like kindness, honesty, perseverance etc., and our Spirit card is designed to promote good behavior by “catching” students doing something good. As we celebrate our 60th anniversary, we are proud to offer an education of excellence in spirit, mind and body! Saint Ann Catholic School, a ministry of Saint Ann Parish, rooted in Gospel values and the teachings of the Roman Catholic Church, welcomes and inspires children in Pre-K through 8 to Live Jesus, to embrace academic excellence, and to foster discipleship in the spirit of Saint Francis de Sales, the Gentleman Saint, and Saint Ann, the Grandmother of Jesus. In partnership with our families and the community, we support and celebrate each child as the Heart of God on earth through an education of mind, body and spirit. 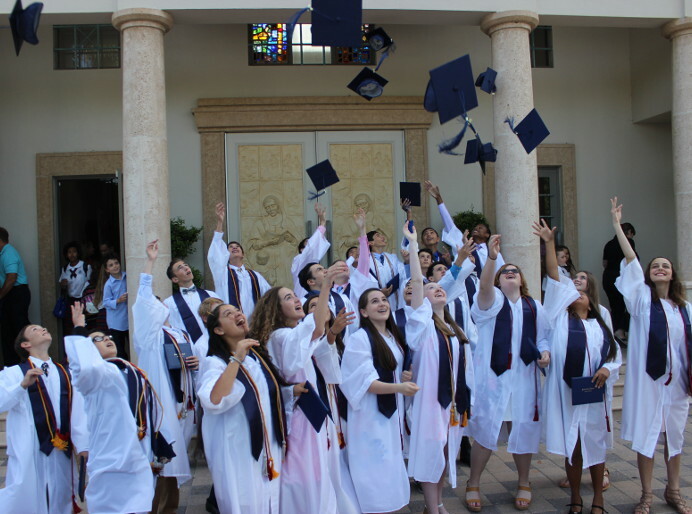 The fundamental purpose of Saint Ann School is to promote the teachings of the Catholic Church and to instill in its students a profound and personal spirituality. The school seeks to provide a unique setting where spiritual, academic, emotional, social and physical growth is realized within our faith community. The faith community is strengthened and nourished by active participation in liturgy and prayer. The school develops Catholic values and attitudes within its students, faculty and staff and emphasizes our responsibility to bring Christ to others. Academically, students are afforded the opportunity to advance their individual abilities and to realize their unique talents. This is accomplished by the faculty and staff being responsive to the needs of the students, empowering them with skills and factual knowledge that stimulates creative thinking and by uniting the Christian community in prayer, work and love. Our pursuit for academic excellence is strengthened by our common love for Jesus Christ and the depending of our children’s faith and trust in God.